Two main things happened in this episode; Emma and Regina finally had a confrontation about what happened with Marian and we also got more questions about The Snow Queen and her plans as well as found out how she once knew Emma. This episode confirmed that The Snow Queen did not come over to the mortal world with either of the curses. She has been in our world for quite a while. The last scene made it seem like she was at one time one of Emma’s foster families. This revelation raises more questions about this woman. How long has she actually been here and what was she doing with young Emma? Why did she erase her memories? Because something went wrong? Also did she ever go back to the Enchanted Forest during that time? She does not looked to have aged all in the twenty plus years, why? I know that whatever she has been planning is elaborate and going to be complicated. This is a point about magic that we haven’t seen before. So far we have seen magic controlled by love and by anger but no one has every made a point that they control their magic by fear. Fear can be all consuming. Everyone has been afraid at one time; whether it was walking through a haunted house or waiting for test results to come back. You get tense and the world becomes focused on that one thing that you are scared of. People make rash decisions when they re afraid. We laugh at horror movies when the victim runs upstairs instead of out of the house. But when you are consumed by terror you can’t think things through rationally. You run to get away or you lash out. Fear makes us irrational and only concentrated on surviving. Which is why this idea is so interesting. We can assume that The Snow Queen is no stranger to fear or terror. Why she understand fear so well we do not know yet but I think she has been alone and she has been working to survive for quite sometime. Whatever caused her fear The Snow Queen has found a way to control her fear and use it to her advantage. She is strong, cunning and if she has been afraid long enough or enough times I can easily see her taking that helpless and making it into an asset instead of a weakness. Does fear really have any affect on her anymore? How will this change how Emma will be able to fight her? Generally you want the enemy to fear you and thus backdown but if The Snow Queen controls her fear this becomes an obsolete tactic. Elsa gets out of the chain by telling herself over and over again not to be afraid. She pushes her fear to the background and concentrates on escaping and helping her new friends. She ends up getting herself free because she overcomes her fear. The Snow Queen tells Elsa she is proud because it would seem that Elsa is losing her fear. Why does she want Elsa to lose her fear though? And if Elsa ends up losing her fear in some way does that put her in danger or the people around her in danger? If you do not far anything you put yourself into situations that could be dangerous. To survive we need fear. We need to fear animals that could eat or tear us apart and we need to fear that person with the weapon that could kill us. If we don’t that fear we have a greater chance of lashing out and getting ourselves killed. Our survival instinct has a sense of fear to it. If Elsa loses her fear what will happen? Will she be reckless or cruel like The Snow Queen? Why does The Snow Queen want Elsa like this? She rejected Rumple’s help but does she need a different kind of partner? Does it have something to do with Elsa having the same type of power as she does? The other main aspect of this episode was Emma and Regina finally having a real confrontation about what happened with Marian and Robin Hood. Regina is pissed and she doesn’t want to be around Emma. She sees her heartbreak as Emma’s fault. In Regina’s eyes all her recent issues and problems are become of Emma and she isn’t entirely wrong. Emma makes a statement to Elsa that once you screw someone over it become difficult for them to ever trust you again, if they ever will. She knows how it feels to be betrayed and she can’t blame Regina for hating her. She knows that righting this is going to be nearly impossible but Elsa does not let her give up. She tells Emma that you do not give up on people you care about, you keep trying. It will take time but you can’t walk away. Emma realizes that she has to take a different angle with Regina. She can apologize all she wants for what she did but that won’t change anything. She goes to talk to Regina one more time and tells her that she wasn’t looking to assuage her guilt she was actually looking to reconnect with someone she thought could be a friend at one time. Emma tells Regina that while she finally has the family she always dreamed of in Storybrooke she doesn’t have someone who can understand her like Regina can. Both Regina and Emma are misunderstood and have been rejected. Emma never found herself until Henry came for her. She never thought she was truly wanted just like Regina after Daniel died. Both of them became closed off and angry against the world. No one else in their lives can understand how that feels. Everyone else has been loved or accepted at one time. Regina and Emma know how the other feels when someone makes a wrong assumption about them. Regina and Emma need each other. Each needs an ear to listen to them when they are feeling lost and rejected as happened frequently with both of them. They can be there for one another. When they talk to each other the other actually understands and can help in a useful manner. They need someone to balance them and they can do that for each other. “You’ve never had my back and you never will,” – Regina – Regina has never let anyone have her back. She can’t trust easily and when she was warming to Emma, Emma goes and screwed things up with Marian. But Emma can have her back and visa versa. Regina just needs to actually trust someone for once. 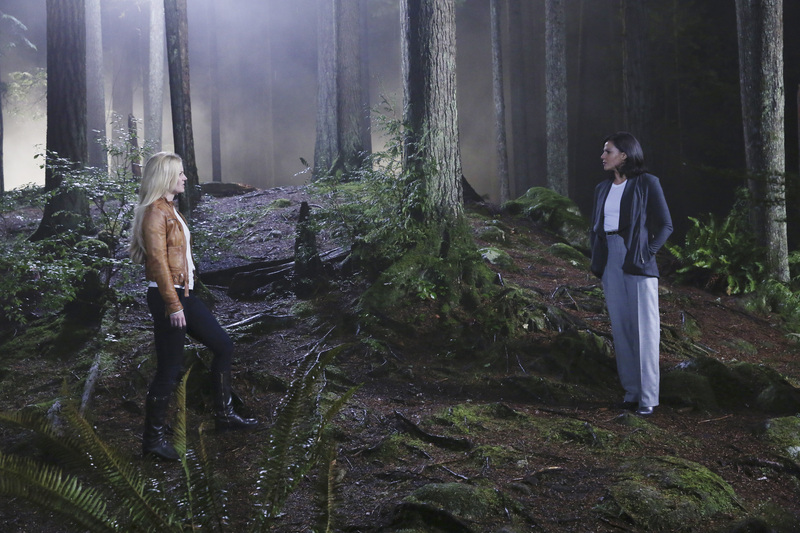 “Learn to live with it,” – Regina – This is in response to Emma professing that she feels bad about what she did. Regina is not accepting her apology easily or tries to fix things. She isn’t going to let Emma off easily. Regina has to live with her pain everyday so does Emma. What is the mirror for that the Snow Queen completed? What other mirrors are involved? What did The Snow Queen do to or with young Emma? Why did she erase all memories of herself? Why does she want Elsa to learn to control her fear? Can Regina and Emma be friends and support each other? Can either of them allow someone else to help them or support them? Posted on October 27, 2014, in Once Upon a Time, Tv Shows and tagged Breaking Glass, Elsa, Emma, fear, friends, Once Upon a time, Regina, The Snow Queen, tv show review. Bookmark the permalink. Leave a comment.